Feeling blue? 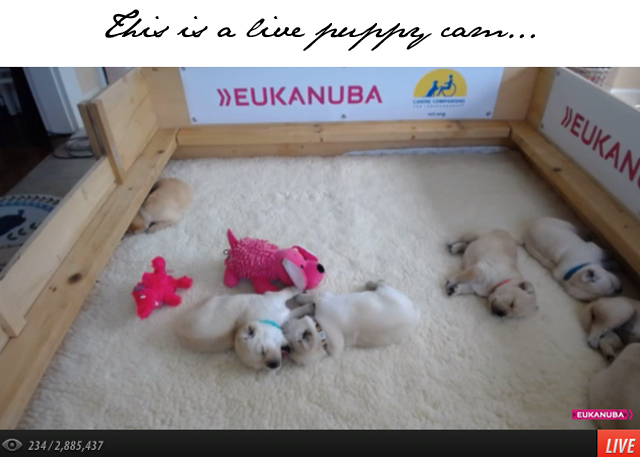 Here's a live puppy cam... you're welcome. The week's almost over, folks, but as we still have one day left we figured we'd give you a little desktop inspiration to make it through. This comes in the form of seven new born puppies. Born on the 18th of March, these puppies are brought into this world with a special purpose. As they grow, they will be trained to become Canine Companions for Independence. These dogs will assist the lives of men and women living with disabilities. In short, this is an amazing campaign to help spread the word about a phenomenal organization. We're happy to support the cause and spread smiles. Get ready to feel all warm and fuzzy. Here are the beautiful pups. Warning- they sleep a lot. But hey, they're only a few weeks old. Give 'em a break.